Thread: Nova Kitcar Subaru flat-six PPC magazine project car or scoobynova. I think David has used them in the past. 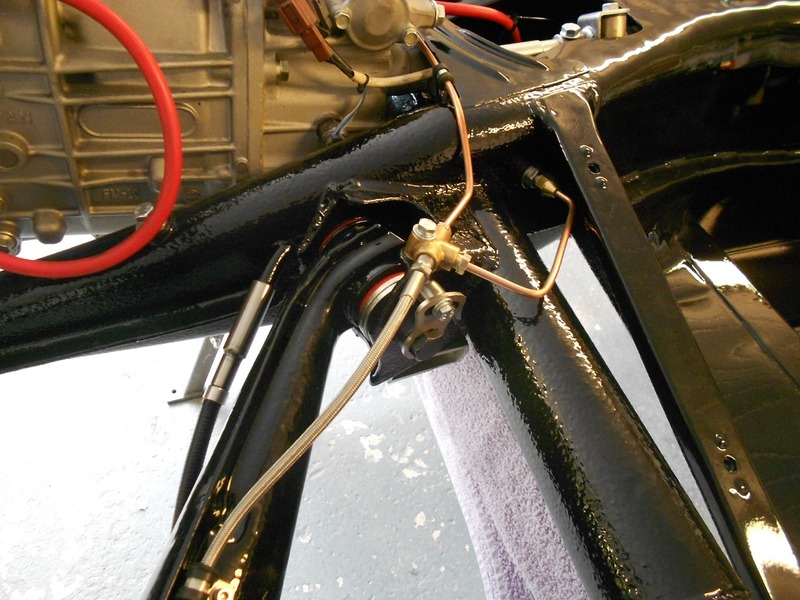 I fitted the last hard line along the frame head at the weekend, I hit a glitch on the rear lines though; the plan was to use 600 hose (the braded stuff in the pic) from the brass union all along the trailing arms to the calliper. However I couldn't get the hose to sit clear of the arms when the suspension moved through its travel. The hose rubbed on the trailing arm, so I am going to use the stock black flexi sections which attach half-way along the arm (there is a temporary one in the picture), it means an extra joint and moving some mount points, but better now than later in the build. I had some bolts welded inside the trailing arm mounts (just visible below the 2-way brass union) the welds fouled against the 'arms at the bottom of their travel, easy fix with a power file, but good to find before the chassis goes to paint. Overall the dry build has picked up several such issues. Nice progress. I totally agree with you on the dry build, its not something I did on the Avante and did regret it. I will probably take it one step further when I do the Nova, body on wiring sorted engine running and the whole car driving and then take it apart to do the painting. Looking good Steve ... I'm already regretting painting too soon. I have just seen these 'improved' IRS Pivot bolts for attaching the IRS trailing arm to the frame forks. The stock VW bolts have a 'dimple' in the bolt head and the idea is that you use a hole punch or somesuch to bend the mounting neck of the bracket into the dimple to prevent the bolt working loose. This design seems easier to lock off, i.e. using wire through the bolt head, and importantly they are easier to unlock for maintenance. Any thoughts? Are there any other options for locking off these bolts? Although I do prefer Flatlands way of doing it and if ever my wire snaps I will go down this route or something similar.